30+ years ago, when I was learning about op amps, I read a manufacturer-published book on the design of op-amp circuits. It was not only technically accurate and easy to understand, but it was almost hysterically funny. I think it was a Philbrick publication. But I'm not sure. I'd like to find a copy because, as a technical writer, it's a reference for writing "light" or "comic" documentation. It was that good. Any help you can give would be most appreciated. Thanks in advance. I am copying this email to Dan Sheingold who contributed the majority of the material in that book, along with Philbrick contemporaries Bob Pease, Alan Risley, and Ed Maddox. George Philbrick was irrepressibly witty, and that set the tone for the company. Glad to see you consulting a classic of technical writing. This appears to be it. Not only is it tongue-in-cheek, but I remember the landscape format and the photo of the vacuum-tube op amp. What a pleasure to read a book written by engineers that is actually readable, understandable, and witty. 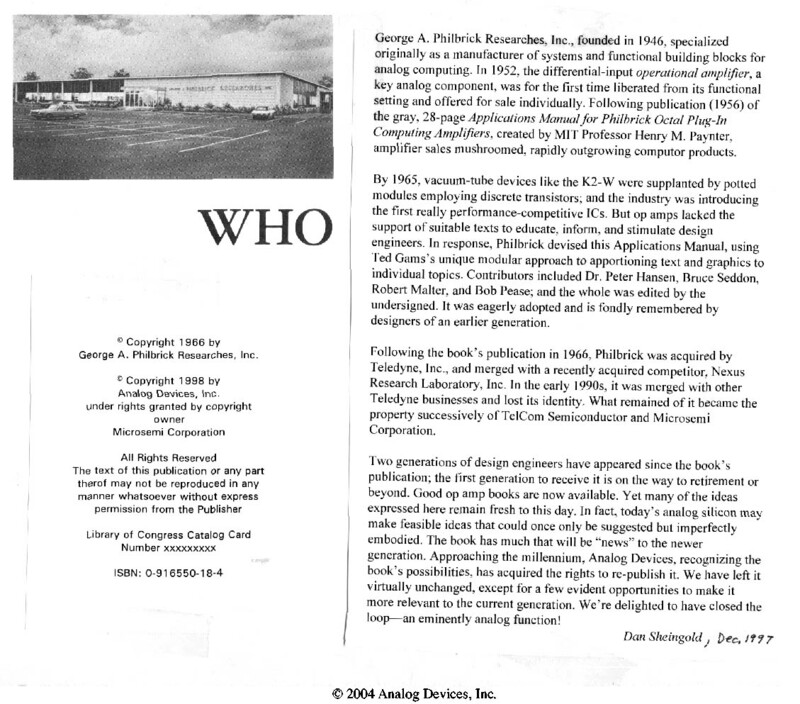 And I wasn't a Philbrick contemporary, but rather a Teledyne Philbrick Nexus employee. I was too late to work with George. George Philbrick was irrepressibly witty, and that set the tone for the company. *** Hi, guys, I contributed a very small part of that Apps Manual. I don't recall if I did contribute anything more than the F-to-V converter. Certainly not much. So, about 1/2 page. I did very little of the proof-reading or checking. I don't recall if Al Risley contributed any. I'm not sure if he was even at Philbrick in 1965. Ed Maddox was definitely not. He was a Nexus man. Bruce Seddon contributed some. Dan Sheingold might recall who did a lot. But George contributed the STYLE. Dan polished all the circuits into the style that George led with. Then I am sure George did the final editting, to make sure he made the right points, with the right words, the right phrasing, and the right FEEL. Of course, some of the circuits and ideas came out of the old "Octal" Apps Manual for K2-W's, and a lot of that was George's. So that's where it came from. Did Bob Malter contribute any? He was deceased by the time that Manual came out, but he might have originated some of the apps. Did Billy Fitzgerald do the art? Not sure. Was Ted Gams involved at all, in the Design? I'd guess that Dan, George, and Billy put in the right layout and the right visuals. Do some people find it rather funny? I never thought of it as funny. The text was odd and Philbrickian. A little stilted, but that is OK. If somebody is not content with printing the pages off the web, you could try to buy a real one off ebay. The last I heard, the going rate was $300.50. Pretty steep for a $3 book - - a good investment! You might say, keeping up with Inflation at 12% per year!! were by Ted Gams's organization.